Why should you use a .AC.UK domain name for your Academy? one of the most recognised and coveted domains in the World is a .ac.uk domain name, and your potential students know this. a .ac.uk domain brings great trust to any academic establishment, and your visitors to your website will trust the content. 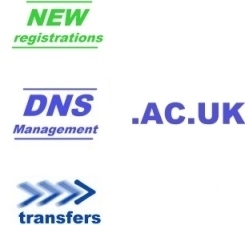 Read about why .ac.uk are trusted domain names. a .ac.uk is many times the price of a .com domain, but DO NOT attempt to compare the two apart from cost. Using a .com domain indicates the establishment is an international player, however, it also says: it is a trading-company. Using a .co.uk domain is the same, except it shows it is a UK company. Most academic establishments funded by the UK Government should be using a .ac.uk domain name. Never accept a lesser domain extension for your valuable academic establishment.